Kit preview of RealSpace Mercury-Gemini-Apollo. Since its debut in the early '90s, Glenn Johnson's RealSpace Models has been doing an excellent job of filling in the gaps that exist in the non-fiction spacecraft model market. With a dedication to accuracy, high production quality, and reasonable prices, all his offerings have been welcome additions to this scale modeling genre, under-supported by the industry's big guns. 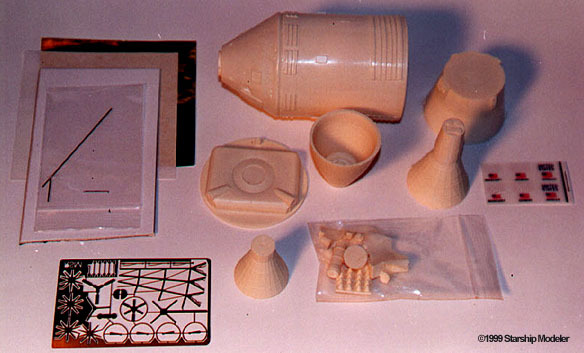 Continuing with his excellent choice of subjects, RealSpace's released a 1/72 scale capsule set, covering the Mercury, Gemini, and Apollo programs. This subject is outstanding for a number of reasons. First, it's the only time these capsules have been offered as a 1/72 kit. Second, the level of accuracy- especially in the Apollo and Gemini spacecrafts, is better than almost any kit previously made of these subjects - especially in the case of the Apollo CSM. For your $60 (1999 price), you get 34 resin parts, one sheet color waterslide decals (made by Microscale), three metal wires, one photoetched detail sheet (25 parts), one sheet thin gold foil (handle with care! ), and a painting and assembly instruction sheet. All th resin is crisply cast with few to no bubbles. Casting is an area which RealSpace has dramatically improved on in the past four years. Click the lower picture to the right for a detailed view of all the parts. Before I get too far into this review, I should note that I bought this kit when originally released in '95-'96. Since then RealSpace has made some improvments in this kit's design, as well as in their casting techniques. Glenn Johnson generously supplied me with samples of the newer part quality, and I've adjusted this preview accordingly. The best way to review the details of this kit is to examine each of the spacecraft separately. Let's look at the Mercury capsule, first. Click either image below to see larger view. ^ A photo of the manufacturer's build-up, showing the completed family. This is also the best painting guide supplied with the product. The base and support rods do not come in the kit. ^ Here are the (circa '96) parts. Aside from improving the casting quailty since then, there were several parts enhancements, such as supplying hollowed out RCS thruster bells. Ah - the trusty can that fits the spam. The Mercury capsule is made up of twelve parts - seven resin, four photoetched, and one wire. The escape tower frame and retro-rocket restraining straps are brass photoetch, with fine, sinuous detail representing wiring. The main capsule has fine and crisp ribbing detail. 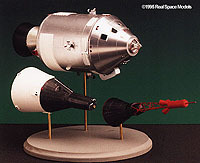 The Gemini spacecraft is the most sparse on parts couunt: two resin (the capsule and equipment section), one photoetched (the horizon sensor), one wire (the tri-axis magnetometer boom), and gold foil (equipment section thermal blanket). There may be more parts that attach to the magnetometer boom, but the instructions were vague on this point and I didn't have any more parts in the box. Two areas of Gemini detail which immediately delighted me were the nose and tail. The nose is modeled with the fairing jettisoned, thus exposing the detail beneath: drogue chute canister caps, cables, and transponder. The arrangement of the details leads me to believe the model depicts Gemini VII. Unfortunately, from all the reference I have, the nose looks a little too long - especially given the jettisoned fairing. The tail, or more specifically, the aft of the equipment section, features the accurate conical depression plunging into the section's interior. The gold foil sheet is then applied, simulating the thermal lining. Again, many kits - most notably the Revell/Monogram family - trip up on this detail, leaving the back open, not accurately modeling the flight configuration. Finally, the Apollo CSM - the piece de resistance of the kit. The only kit that comes close to this one's accuracy is the Monogram 1/32 CSM. All others that I know of are Block 1 designs, not the Block 2 that actually made the lunar flights. There are several differences, which I won't get into here. Suffice to say, if you want accuracy, this is your best choice. The CSM is in 50 parts! The Command Module and Service Module are molded as one piece, making it one honker-big block of resin. Each RCS cluster is made of five resin parts. Photoetched parts are provided for the EVA/recovery handles outside the CM, the high gain antenna (13 metal parts and one resin - the nicest high gain I've ever seen on a kit! ), VHF antennae, and the docking probe. Just the docking probe parts alone are neat enough to make you break out in a sweat. The exhaust bell and SM (that's "Service Module", not "Starship Modeler"...) endcap are separate resin pieces. The bell is hollow all the way to its base. Finally, the bulky, Block 2-style umbilical connector is its own piece. All in all, the CSM is outstanding in detail! Accuracy and detail make this kit stand out. It's that simple. And it's great to have these three subjects in one kit, all adhering to a standard modeling scale. The painting instruction could have been more comprehensive. From what I've seen, this is the RealSpace line's one remaining weak point. If you follow the instructions AND the box photo, you can come closer to accurate detail, but a consolidated and complete painting guide would have been a real plus. I recommend tracking down as much reference as you can to try and accurately paint this set. There are good online resources for this, if do some searching. All in all, this kit seems worth its $60 price tag. RealSpace deserves a big thanks for filling this gap with an excellent product. It's obvious this kit was a labor of love. RealSpace products are available direct from the manufacturer. This review has been updated since it's original 1996 publication in the Scale Modeling Tangents webzine. This page copyright © 1997-99 Starship Modeler. Last updated on 31 May 1999.